Oh, how I am filled with dread. Before booking a trip, one of my top travel tips is to read the Trip Advisor reviews of your preferred accommodation. And this is exactly what I do. I find a great travel deal and go straight to Trip Advisor to check out the Mai Khao Lak reviews. They are all good. But then the unthinkable. After booking and paying for our eight night Mai Khao Lak Luxury Escapes deal, the reviews turn bad. So I plan for the worst. I read every awful review and create a contingency plan. We will still be staying at the Mai Khao Lak resort, I just now know how I am going to cope with the main problems that continue to be mentioned. But do you know what? It ends up being a really lovely stay. Most of the things, other people have complained about, don’t happen to us. Read on to learn about our experience at the Mai Khao Lak Beach Resort & Spa and what my contingency plans are, so should the issues happen to you, you’ll know what to do. Just use the share buttons to the left of the screen. This post by Tips 4 Trips contains affiliate links*. This means I may receive a small commission if you click on these links, but at NO extra cost to you. SilkAir ReviewThe drive is relatively scenic, passing through towns, small villages and past green fields of farmland. Today though, we are lucky to have extra entertainment on our drive. It is Songkran. The water festival celebration for the Thai new year. Basically, this involves splashing as many people as possible with water. We follow behind many utility vehicles filled with small groups of people and a large barrel of water. As the utility passes people on the street or a motorbike whizzes by, those in the back of the utility throw small buckets of water or aim water pistols at the passing offenders. It is all quite fun watching from the safe cocoon of our air-conditioned car. Our car slows to crawl at Khao Lak village town. The streets are filled with happy colourful soaked people and loud festive music. Once past the festival, it is a further ten minutes to the Mai Khao Lak Beach Resort & Spa. The heat just slaps us in the face as soon as we get out the car. I feel a little sorry for the staff working in the open air lobby with the sun beating down on them. But they are still friendly. Welcoming us with a smile, directing us to the water and cordial coolers that are permanently available in the lobby. Perfect as we are here in April, the hottest month of the year in Thailand. The staff member processes our accommodation voucher, passports, takes a deposit from the credit card (that is refunded on departure) all while we sit back with a cool drink and hand towel. Opening the door to our suite we enter straight into the large chocolate tiled dressing room. To my left is a double mirrored sliding wardrobe with ample hanging, shelves (with towels – no face wash), draws and a safe. 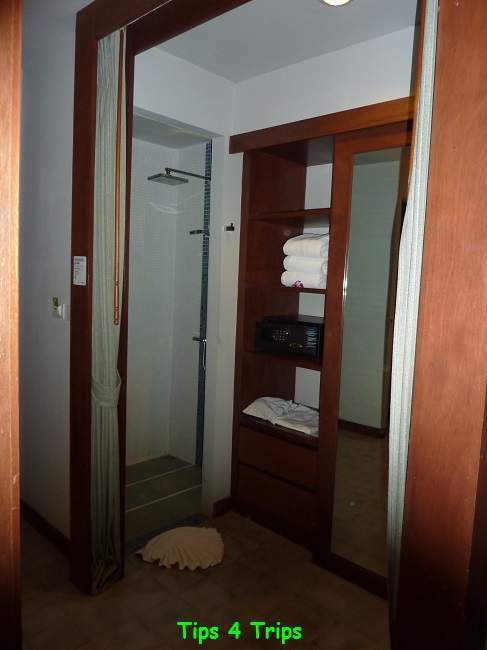 There is also a separate standing shower with a frosted glass door. 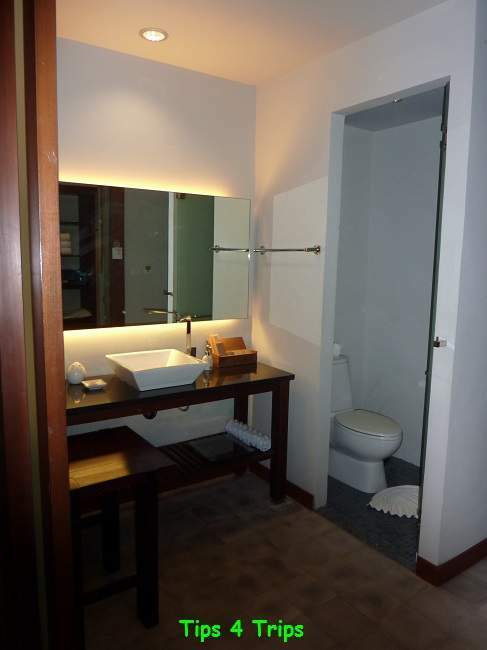 To my left is a dark wood vanity with shelf below and a separate toilet with a matching frosted glass door. Making our way through the double wooden sliding doors we are in what would be the lounge. But has been converted to our son’s sleeping quarters. The grey pullout couch looks onto one of the TV’s and the mini bar – that is seriously set up for families. It contains an empty mini bar fridge, microwave, coffee percolator, kettle, complimentary coffee, tea and sugar. The lounge/kids zone is separated by wooden Venetian blinds and a block out curtain which we don’t close as the air conditioner is positioned just above the mini bar. Our section has a large king bed (just a bit a sag in the mattress) that is flanked with side tables and reading lamps that look onto another TV and mirrored desk area. From our area, we are able to look out to the pool and ocean glimpses from the expansive balcony. The balcony has two chairs, a table and a wooden clothes horse. There’s really not much more I could ask for. The complimentary WiFi for four devices is sufficient and if you have trouble logging on the staff are more than happy to help. The only real issue is the limited choice in TV channels. This is something we haven’t encountered on our Asian travels before, most hotels usually offer a good choice of cable TV. You might be thinking but I didn’t come to Khao Lak to watch telly. But when you travel with kids and they go to bed at a reasonable hour, you come to rely on watching an evening movie. There is a DVD player, but when we go down to borrow one of the resorts free movies there are only a couple of Barbie movies. Meh! During the day though it is not really an issue as there is just so much to do. These are my plans to combat the issues that kept being mentioned on Trip Advisor. The Mai Khao Lak waterpark is expansive. Stretching all the way from the beachfront to the rear of the property approximately 500m inland. And whilst it appears you are spoilt for choice with swimming pools, the reality is a bit different. The pool areas do not flow easily from one to the other. Meaning that every time you want a swim in a different section of the pool you have to pick up and completely relocate to the next section. Not so bad for us but if you have toddlers it could be annoying. The main pool situated beach side of the original hotel is the most popular. It looks inviting and clean with its wavy blue tiles. It’s shaded by the hotel rooms and trees extending up out of the planter boxes within the pool. Many of the kids either play catch or laze about on an inflatable. As we have arrived during the change over from Tui Family Life to the hotel taking back control of the activities. It takes the hotel staff a couple of days to get their activity program back into motion. As such, I didn’t see any water activities happening until our last day. Bummer – I was looking forward to the water aerobics and water yoga. On our last full day, I see the programme is in full swing at this oval-shaped pool nestled amongst the villas near the beach. In 2017 an entire new wing stretching inland opened. Part of this upgrade includes the waterslides, toddler pools, terraced pools and adults only pool. One of the reasons I chose to stay in this resort was the water slides. However, after booking, I learn that the water slides are only open at select times. Goodness knows why they would go to the expense of putting in water slides if they are not open all day? Perhaps it has something to do with the slides being very fast and some younger kids getting a bit battered and bruised. One of the requirements for kids using the large water slides is wearing the blue crash helmets. I would also highly recommend, that if you have young children under about six years then not to allow them on the large water slides. My son is a solid ten-year-old and he coped fine on the fast slide. I checked out the “slower” slide, it was fun, but I wouldn’t want to use the fast slide. But don’t worry, the little kids won’t miss out on the fun. They’ve got their own whole little mini Mai Khao Lak water park. The knee-deep toddler pool has a coarse sand bottom and the water is quite warm. But from what I could see the littlies were loving the splash zone. This fun water park is filled with mini water slides, tipping bucket and other fountains. Making your way further inland from the toddler pool and water slides are the three terraced green tiled chest deep pools. Each of these pools can be accessed via various points within the paths leading to the new resort rooms. These pools are always in full sun and are pleasant to hang out in. At the very end of the resort is the adults-only section. We had heard that earlier in the week kids were swimming in this section due to overbooking within the resort. But whilst we are staying at the resort I only see adults in this pool. It is very tranquil floating about the slightly shaded pool. Yet also social around the swim up bar. If I was staying here without kids I’d be pretty happy with this zone. When staying at Mai Khao Lak Beach Resort & Spa all room deals include breakfast. For additional meals, you can also opt for half board, full board or pay as you go. This is the buffet restaurant in the original part of the hotel. We eat breakfast here only twice. Once because it is our first breakfast, before realising there is a better option and the second time because we have an early tour and this restaurant opens earlier than the other. The Mangrove is OK, but that’s about it. Buffet 2 is where you really want to eat breakfast and where we also have a wonderful International buffet dinner. The menu is the same in both buffet restaurants it just better quality food at Buffet 2. Breakfast is your standard buffet breakfast fare. Cereals, toast, cold cuts, bakery, eggs, bacon, sausages. What I do love is the kids’ section being laid out on a lower bench and therefore easier for the kids to help themselves. I also like that there is a toaster oven at the bakery section to heat up croissants and danishes that should NEVER be placed in the commercial toasters. Our International dinner buffet is actually very good. I am quite surprised as buffets are often very ordinary. We have a choice of spicy appetisers from Mexico and Asia. Main courses (some spicy, some not) of pasta, paella, fish, lobster, curry, roast vege and salads. Then mini deserts to sample our way through a variety of cakes. On the other hand, The Meal restaurant is just plain yuk. The staff are ill-trained and the food ill-prepared. Our set menu is rubbery with too much chilli and yet no flavour. During our set dinner on the last night I discover that The Meal set menu changes daily – perhaps another night might have been better. Fortunately, that is our only bad meal. At the Green and Grill, we have a lovely Italian meal of pasta and pizza. The staff here still need a bit more training but at least they are trying hard. We didn’t actually eat here. But met plenty who did and they all raved about it. It is located on the beach front and offers local prices. Part of our Luxury Escapes deal is a free ice cream each which we enjoy one afternoon at Thea’s. This is also the place to come if you want a proper cup of coffee as opposed to the machine expresso at the breakfast buffet. If you still need food in between there is the Pool Bar. It is your standard menu of pizza, burgers, hot dogs, toasted sandwiches and chips. The staff again are struggling a bit with taking the orders but the food is good. Check The Menu’s set menus and choose the best option for you. This is the place to come for you inclusive massages. It is very busy and the poor staff struggle to keep up with demand. I leave it until halfway through our stay to book our massages and can only use half our vouchers as they are fully booked. Both my son and I really enjoy our massage – we just wished we could have had more. We are compensated with drinks vouchers. The gym is located next to the Spa. I didn’t actually use it but did pop my head in and noticed lots of modern equipment. There is a free shuttle service running three times a day into Khao Lak town. You will need to book at least 24 hours in advance to secure a spot on the large tuk-tuk style truck. There is a mini mart located near the toddler pool. The prices are a little elevated. Take a stroll along the beach and use one of the local stores for cheaper prices. Next door to the mini-mart. It’s handy if you get very sick. Perhaps prepare yourself by packing a DIY First Aid Travel Kit. We didn’t discover this hidden away among the villas until towards the end of our stay. It offered a great option for the tweens as the kids club is aimed at young kids. Computer games are available on the four computers. A bright air-conditioned space with toys and a mid-day family movie. This is also the place to come and register the kids for activities like Muay Thai boxing and tennis lessons. You can also leave the kids here during your Thai cooking class. We don’t actually play tennis – it’s just too hot in April. However, there is a large shaded kids playground on the grass leading towards the beach and villas. A good option to get young kids to burn off some energy during the early morning or before bed. The daily activities are displayed on a pin-up board in the lobby. It is advisable to book one day in advance otherwise the staff think no one is interested and don’t turn up. Muay Thai Boxing is offered to both kids and adults (different session times). The instructor has a great sense of humour and my son really enjoys the activity. As I mentioned earlier this didn’t get up and running til our last day. But the humorous instructor who took the Thai boxing was taking the water aerobics so I’m sure it was a fun way to burn off some of those breakfast yummies. The Thai cooking class is very crowded and you don’t actually get to cook unless you are one of the chosen few. But it is a good afternoon and I picked up a few tips on cooking Thai food. The bonus, however, is that you get a full three-course Thai lunch. A mocktail is a non-alcoholic cocktail. It is held at the Music and Wine Bar in the full setting sun. There are lots of kids but they each get a turn to make their own cocktail. And then, of course, drink it. This is another one for the kids. They each get to make their own pizza and then eat it for lunch. I was actually very impressed with how well the staff coped with over 50 kids making pizza. Mai Khao Lak Beach Resort & Spa is located on Pak Weep Beach approximately seven minutes from Khao Lak Village in Phang Nga Province Thailand. The closest airport to Khao Lak is Phuket International Airport, approximately a one and half hour drive south. 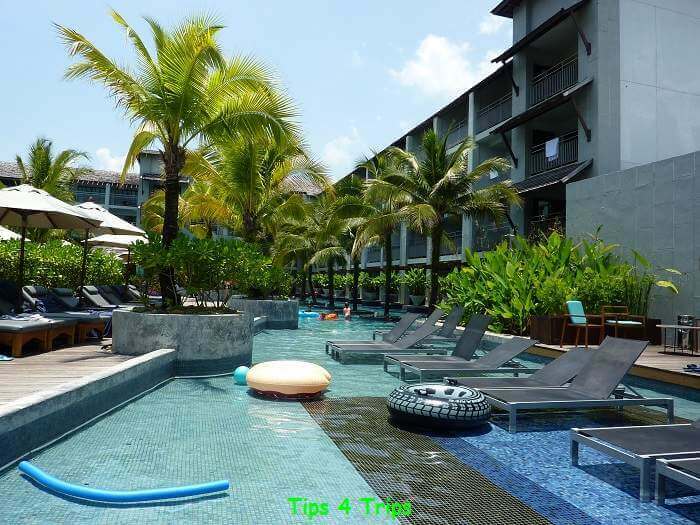 The Mai Khao Lak resort is a little isolated from Khao Lak, however, a free shuttle is offered three times during the day – ensure you book at least one day in advance as it is always full. Scooters and motorbikes are available for hire at the resort. If you choose to hire a scooter, ensure you have an International drivers license (if you are Australian here’s how to get one) and that your travel insurance will cover for any unexpected accidents. You can also book flights with Expedia*. There are plenty of beachside restaurants on Pak Weep Beach. Turn right on the limestone track as you leave the Mai Khao Lak resort and you will come across these family-friendly restaurants. Not only do they offer kids menus but there are plenty of swings and toys out on the beach to amuse the kids while you sit back and relax. All the restaurants we eat at are very nice and all offer similar prices. Expect to pay 100 THB per dish, 30 THB for soft drinks and about 100 THB for alcoholic drinks. There’s plenty happening along the calm Pak Weep Beach. Mai Khao Lak Beach Resort & Spa is located within the country of Thailand. Thailand uses the currency of Thai Baht. There is a currency exchange booth near Sharky’s Restaurant, they have a very similar rate to the bank in Khao Lak town. For today’s latest exchange rate check Currency Converter. I have a full Packing List for Tweens HERE. A detailed Travel Packing List for Baby or Toddler HERE. Three Essentials to Pack for All Kids HERE. You’ll also love the Ultimate Trips Packing List and the Packing List for Thailand Beaches and Islands Holidays. To receive access to the free packing lists welcome gift and get more travel planning tips please ensure you confirm your email address. This confirmation email may be found in your junk box (Outlook) or updates folder (Gmail). Overall we really enjoy our eight-night stay at Mai Khao Lak Beach Resort & Spa. I don’t know if it is that I had really low expectations after reading all those negative Trip Advisor Mai Khao Lak reviews, whether others have really high expectations and are therefore disappointed or whether we just got really lucky with our stay. We had a lovely spacious room that was cleaned daily. We enjoyed most of our meals that catered to adults and kids alike. And we had so many things to do at the resort that the eight days flew by so fast we struggled to find time to squeeze in a day trip to James Bond Island. Basically, we just had a lovely time in Khao Lak. Know someone who would find this useful? We paid our own costs. This means I may receive a small commission if you make a purchase using this link, however it does not cost you any extra to purchase through these links. Hi, I'm a Perth born and bred travel tips blogger/writer with 20+ years experience in airlines, hospitality and tourism. I love sharing my travel lessons learned to help you plan for your travel dream with my travel tips for trips. Please follow along to receive all my travel planning tips, packing lists and destination inspirations. You’ve put days and days of work into this review and my question is, why? Our experience was just like the bad reviews of 2017 – June 2018 on Trip Adviser. We were there in April 2018. We got boils from the bed linen. We were bitten by bed bugs or something. We suffered food poisoning from the cafe by the kids pool. The carpet in the lifts is permanently wet and mouldy. The corridors are cleaned so rarely the kids started naming the rubbish, such as “Chippy the potato chip”, who remained on the floor for nearly a week and we saw more frequently than the maids. At night, the rats living under the beach front bungalows would run around the paths. Staff were generally apathetic, especially at breakfast, where they played with their phones instead of attending the tables. Each morning I would drag the shift manager into the dining room and show her the staff playing with their phones … and nothing was done. I did this 3 or 4 days in a row. Nothing changed. On our return home, it took nearly 8 weeks and 3 courses of antibiotics to clear up the boils. Now, Trip Adviser has glowing 5 star reports on Mai Kao Lak. Either Christ has returned and a miracle has been performed, or there is a campaign of fake, perfect reviews. In fact, the word “perfect” seems to be used in a lot of those new reviews … I guess I missed the second coming …. I am very sorry to hear you had such an awful time of it, we too were there in April 2018. As I mentioned at the beginning of my post I too had read many terrible reviews but only after I booked. As a result, I suppose, I visited the Mai Khao Lak with very low expectations and therefore it turned out to be not nearly as terrible. Yes, the staff at breakfast were quite hopeless. But I always found a clean table to sit at and the food pleasant at Buffet 2, though sometimes I had to prompt for more clean mugs a the coffee bar. We stayed in the old part of the hotel that was cleaned daily and only ate the hotel for our included meals – the food was just so cheap at the restaurants along the beach. I write my reviews of hotels and airlines based purely on my experience – some of them are negative and some are positive. On this occasion, we did not have a bad experience. This is not a fake review. 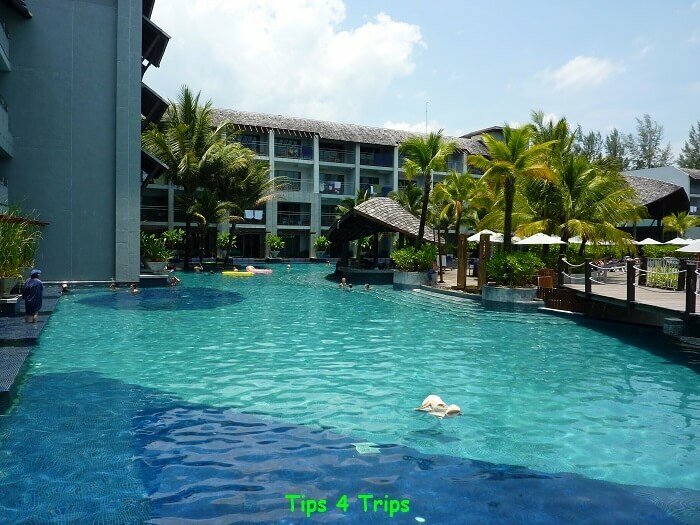 This is my family’s experience at the Mai Khao Lak Resort for eight nights from the 13 April – 21 April 2018.